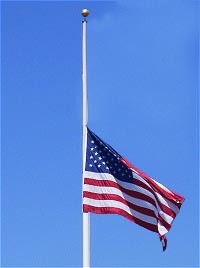 Governor Jay Inslee has directed that flags be lowered to half-staff beginning Tuesday, April 16, 2013, as per President Obama’s proclamation as a mark of respect for the victims of the tragic events in Boston, Massachusetts. Flags should remain at half-staff until sunset on Saturday, April 20, 2013. As a mark of respect for the victims of the senseless acts of violence perpetrated on April 15, 2013, in Boston, Massachusetts, by the authority vested in me as President of the United States by the Constitution and the laws of the United States of America, I hereby order that the flag of the United States shall be flown at half-staff at the White House and upon all public buildings and grounds, at all military posts and naval stations, and on all naval vessels of the Federal Government in the District of Columbia and throughout the United States and its Territories and possessions until sunset, April 20, 2013. I also direct that the flag shall be flown at half-staff for the same length of time at all United States embassies, legations, consular offices, and other facilities abroad, including all military facilities and naval vessels and stations. IN WITNESS WHEREOF, I have hereunto set my hand this sixteenth day of April, in the year of our Lord two thousand thirteen, and of the Independence of the United States of America the two hundred and thirty-seventh.